*Depending upon the size, your order may or may not be completed in 48 hours. If you would like to join, please fill out the form below and submit it. After filling out the form, jromagnoli or -AwesomeAdvanced- will decide whether to hire you. Before you fill out the form, please read our goals in its entirety. Have you had any experience with using external art programs? Be sure to follow the thread! If you are quitting, please fill out the form below and post it in the shop. The form lets us know how we can improve the job experience and how we can effectively recruit others. After filling out the form, no other action is necessary. Can take anywhere form 1 hour to 1 week. Please keep it to 1 sentence, usually takes 1/2 hour. New Item! 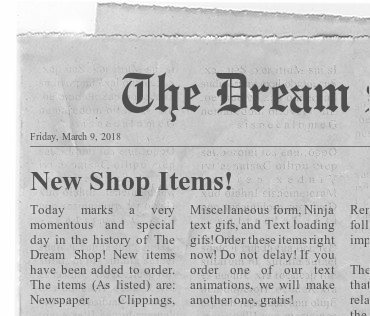 Animated text gifs! Note for staff: ALWAYS click NO to keep original colors! Click no on transparent background for background, click yes for outline. 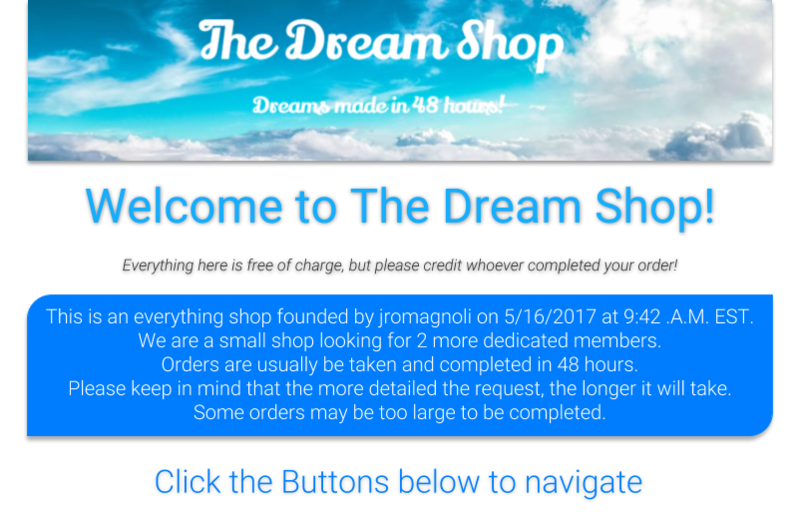 By ordering from here, you consent to the fact that jromagnoli's shop may not be able to complete your order. *Credit to ZZ9PluralZAlpha for this idea! red = Old - somebody please take this! Glitches/lag (x/10): 8/10 no lag, sometimes asteroids kill you too early. Coding (x/10): 8/10 Really simple, but works for the most part. Art/graphics (x/10): 6/10 The graphics are nice, but are poorly erased and very pixelated. The menu is very simple. Misc features (x/10): 2/10 the graphics are a nice touch, but that's all. Originality (x/10): 7/10 The game is fairly original, but there have been some like it. Overall thoughts: 6.2/10 An average game with average graphics. Suggestions: Spend more time on the graphics, add some more features, and make it so that the menu reappears when you die. Glitches/lag: (6/10) No lag on my computer, however be assured that it will lag on lower end computers due in no small part to the extensive use of the sluggish color effect block.. There are quite a few glitches with the platformer script, namely the object collision. The cube will bounce off at unnatural angles from the ceiling or move into the ceiling entirely. When colliding with the walls, the cube may become embedded in the walls and will not come out easily. When not embedding in the walls, the cube bounces off in an unsightly manner. Coding: (8/10) The coding contains multiple unnecessary forever loops, and some of the moving object coding could be optimized for level transfer. Gameplay (5/10) The platformer script garnered a few complaints from me on the issue of bugs, but there are some other issues with it as well. The platformer script has a high jump yet a short jump curve due to the slow player speed. The removal of velocity made the platformer script akward to use, and with the addition of the high jump, it is not an enjoyable experience. The bugs only add to the current state and make this very frustrating and easily quittable. Another feature that I disliked was the addition of a popup before you change levels. While the popup can be helpful, it is annoying and I suggest an option to turn it off at the main menu. Just a very small note, but the rope climbing would be better if y-velocity was incorporated so if the up arrow key was not pressed, the character would slide down. Art/graphics: (7/10) The graphics are enough to suffice for an average platformer, but this is not a normal platformer and so it leaves a bit to be desired. Grammar: (10/10) No errors found. Final verdict: (44/60) or (7.3/10) An initially promising speedrun platformer that turns for the worse with frustrating gameplay and different game navigation. Suggestions: Fix the collision detection issues. Make the platforming script smoother. Add more menu options. Finally, try using less of the color detection block. Review provided by jromagnoli from jromagnoli's everything shop. By reviewing us, you consent that we may use your review on our front page without notice. Very speedy and reliable. @jromagnoli and others do a very good job with make logos and banners and they surprised me that they also have reviews! Obey the Community Guidelines at all times. No spam, advertising, or offtopic. If an order is too large or complicated, we reserve the right to ignore it. Please be respectful at all times. If you are dissatisfied, please convey so in a dignified manner and please do not yell at the staff or manager. Failure to comply with any of the terms listed above may result in suspension of your order. If you quote a large post (say 30+ lines) please snippet the unimportant parts of the post to shorten it. This provides a less cluttered experience. Please credit the staff. We worked hard on your orders and we don't feel appreciated when our efforts aren't acknowledged. Thanks! Please do not lie, or spread any misinformation about the shop or its services. Failure to comply with any of the terms listed above may result in a 3 day suspension for first offense, 1 week or greater for subsequent offenses. Please do not take an order if you cannot complete it. This leads to unhappy customers. Hmm… I'll review it and get back to you soon. Misc/additional info: I need it to fit in my signature. sig by @myed - get yours here. Please check out my new coding blog! MasterOfTheTiger: Owner of MasterOfTheTiger's Shop Triple S, Shop Helpers, and SH Orders. 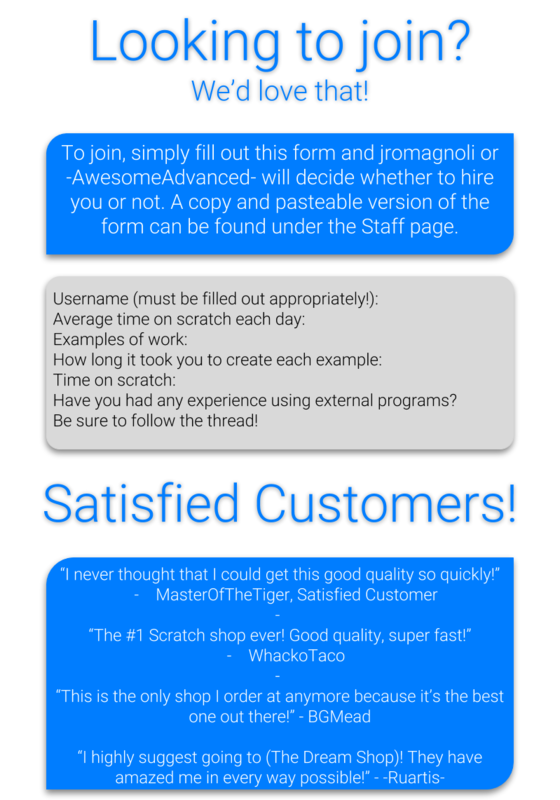 MasterOfTheTiger: Devoted to the success of Scratch Shops. Do you need a good banner, or coding, or something else? Check out MasterOfTheTiger's shop - I do banners, logos, thumbnails, coding, intros and more here! Average time on scratch each day: At least 4 I think. Examples of work: I will include it at the bottom of my post. How long it took you to create each example: a few minutes. Hired! Be sure to follow the thread! Average time on scratch each day: . . . 2-6 hours, depending on the day. Have you had any experience with external programs? huh? Yes . . .? Wow, I'm on Scratch a lot now that I look at it . . .
am i hired as manager? I actually haven't seen your work, please link it.